After letting the JBWeld cure, I was ready to get down to business and try some extrusion tests. I had my nozzles arrayed before me, my power supply ready to rock, and some alligator clips ready to clip. I knew the 0.7mm and bigger ones would extrude, so what I was really interested in was how the 0.4mm and smaller ones would perform. I had my doubts... but they were completely wrong. I usually try to save the best for last, but I cant. All nozzles (including the 0.25mm nozzle) extruded beautifully and at a good rate. I took measurements with my cheapo digital calipers. They may be a bit off, but they were close enough. this was all done with HDPE. those last two were very surprising for me. i honestly didnt think the 0.25 one was going to work at all. boy was i wrong. they all extruded very well. the smaller ones werent even very slow. the HDPE came out fine, and in a nice even stream. since i live practically across the river from mcmaster, i get FAST delivery times. they had my aluminum nuts and bolts here the next day. so once i got my aluminum, i went straight to the shop. however, things worked great! the drilling of the aluminum was super easy, slightly slow on my part. the bit had no problem handling it. there is probably a better way to do that, but it was actually pretty simple. 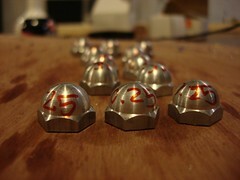 after i warmed up with the bolts, i approached the main issue: the nozzle. unfortunately, i broke all my 0.5mm nozzles, so i used the random ones. first i tried 0.90. piece of cake. it made cool spirals of tiny aluminum. 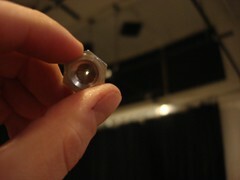 then came 0.7mm. also really easy. it melted like butter. i had an untouched grab bag of 0.15 - 0.40, so i decided to see how low i could go. i loaded up the 0.40, brought it down on the aluminum, and it snapped! aargh. first try and its busted. well, i was actually just a bit over eager, because that was only one of two bits i broke drilling holes. i tried again and easily got a 0.40 nozzle. then i went down the sizes: 0.35 went well... just slow and careful. same with 0.30, 0.25. then i got to 0.15 which is an insanely small size of a hole. unfortunately the bit broke... i think my drill press is just too loose to handle it. it certainly could've drilled through the aluminum. 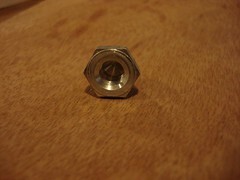 1. the inside of the nut tapers up into a point near the top. its actually very thin. thats why its so easy to drill through... i dont know how to measure it, but its very thin. 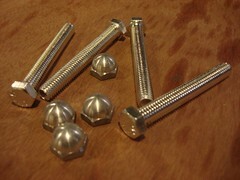 2. the bolt screws all the way in. there is only a small gap between the end of the bolt and the cone area. i dont know the physics behind polymer flow, but it seems right to me. 3. the aluminum conducts good heat, not as good as copper, but still very good. so, after that, i rushed back to the lab at home. i had to try extrusion! i already had a steel extruder barrel worked up, so i wired it up and screwed a large mm aluminum nut on... there wasnt enough thread, so the nut only went halfway on. 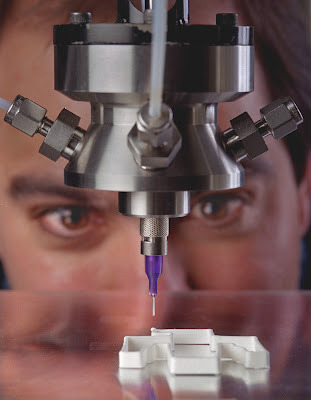 even with that large chamber of plastic, extrusion still worked. i got a decent stream of 0.7, and 0.4 also came out pretty well. i got tired of manually feeding it, so i stopped for the night. i want to wait until i hook up one of the new aluminum barrels i got to see how it works. At the end of last week I assembled our first RepRap Version 1.0 "Darwin" from scratch and shot a time-lapse video of the entire thing at one frame every three seconds. It took me four and a half hours spread over two days (I have to teach sometimes...). Annoyingly, Ed appears from time to time to hinder proceedings using something that I understand is called a "sense of humour", so it is through gritted teeth and with a dark heart* that I have to say that he has done a truly outstanding design job. This is the first time that I have built the machine (all my work so far has been on extruders), and it went perfectly from his instructions on the RepRap Wiki here. Also, the way that he uses bits of the part-constructed machine as jigs and templates to allow one accurately to build and align other bits is, frankly, inspired. You will notice that the only measurements that I make are with an ordinary tape measure. Yesterday I bought a piece of copper-clad board and tried sticking it under Zaphod. The idea being to deposit a trail of CAPA on the copper and then etch the exposed copper. Unfortunately, it looks like copper makes a nigh on perfect non-stick surface for CAPA extrusions. Even after cleaning with contact cleaner and cranking up the heat, I couldn't get any CAPA at all to stick to the copper. Looks like time for plan B; the etch resist pen. Tommelise joins Zaphod and A.R.N.I.E. 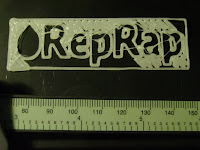 There are now three open source 3D RepRap printers that have passed the "print a shot glass" milestone. That's a standard British 25 ml short shot glass. I was halfway through my second shot before it occurred to me that it was 1000 in the morning, I'd had 3 hours sleep the previous night and hadn't made breakfast yet. I've been hammering getting the shot glass print done, you see. You can read a complete account of the adventure here. Be sure and click on the "Continue reading" link at the bottom of the blog entry to get the complete account. I was really worried about the prototype boards, since they were due to be delivered to my work the DAY we were scheduled to move uptown to Union Square. Luckily, they still got delivered okay. Boy do they look sweet!! 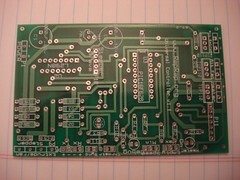 I got a couple sets up on Flickr on them and heres a pic of the universal board. I'll be making the bulk order later this week. I want to test everything and also need to do a few tweaks to the layout. I had a go at printing the logo, whcih adequately exercised the boundaries of our software's stability. Erm, cough, yes, well.